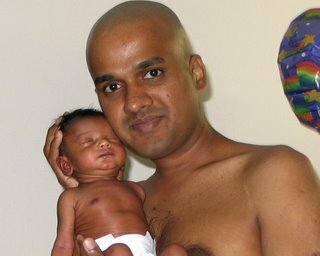 On the day of my son's birth i noticed that i have a lot of hair fall. I decided to cut my hair,but all my relatived told that i should not do as it is not a good omen. But then, i looked at it more from a practical aspect. If the hair gets into baby mouth, i didnt know what would happen. I spoke to the peditrician and she asked me to take it cool and see after some time. My relatives also agreed that i can shave my head after the punyajanam. So i went today to walmart to shave my head. I told them clearly that i want my head shaved. She agreed, but then she used 0 size clipper and she removed hair and i still had a good amount of stub. I asked her to shave and she said that they are not barbers, but beauticians and hence cant use rasors. I tried to show my displeasure to them and told that i have to go to another shop to perfect this. I did this thinking that they will not charge me. Again when i came to the billing section, i asked her to reduce the price, as i had to go to another shop. The lady asked the manager and the manager got irritated with me and she said, "call 911 and place a complaint". I got so scared, i pushed the credit card in their hand and told them not to call police and said "take money". Then i ran from there and came home. Though i was very angry with the manager, i appreciated her decision to call police. Thats the only way to put me in place and let them do their business. What a lesson. I should have gone to my usual shop "headclips". I went to walmart thinking that it will be 3$ cheap. But they also charged the same price. good thing mottai. you wanted to know what happens if baby takes hair - the baby starts purging.